Gemscool Yulgang Online is a MMORPG or background of the comic strip and nuanced Komix. The game Indonesia is managed by PT. Kreon through Gemscool. Here You can make the party system (guilds), choose black stream (Chaos) or white (Order), and choose 3D image profesi.Dengan very cute and a variety of quests and monsters funny comic nuances will make you more exciting adventures. Yulgang story comes from the village located in a valley. Life looks peaceful. The Community learning martial arts, strengthen physical and spiritual strength, and improve skills. However, growing and increasing their ability to forming two large groups, namely Flow Flow Black and White. This happens because human nature is never satisfied and wants to be the strongest. In the world there is no distinction of race. Players during character selection is only a difference in the jobs that will be chosen. But after reaching level 35, players must choose between following the flow of white or black stream. The selected flow will affect the moves that will be studied later at the time of promotion to a higher grade and display these characters. Characters with the same job but different flow will wear different clothes and equipment as well. Elections will also affect the flow of the party that will be entered by the player. Different players can kill each other flow (PK) in specific folders. In fact, there is a quest where players must kill enemy players of flow. Guild in Yulgang called party, according to background martial world. Players can begin to establish the party after reaching level 35 in conjunction with the time the player must choose a stream that would like to participate. Party in the Yulgang not only consist of the party just because a party made up of several groups within it, namely: Mun, Pa, Wang, Sega, Chun, and Jang Ryong. This makes the guild system in different Yulgang the guild system in general. The new feature that gives uniqueness to the guild in a game. Generally in a game while establishing a guild, we are limited to making a special logo for the guild. But in Yulgang besides making the party symbol, a party can make her own clothes with symbols and colors chosen by the player. Party clothes are made is not just a characteristic of a guild, but clothes party can also be upgraded as other clothes. Usually when we are playing a game, we do not have any capital in the game. When we have friends we can get a loan of money or items. But in Yulgang we can get more! In the Online Yulgang person can be a teacher or pupil in which a teacher can have 3 students, subject to a minimum of 20 levels above his. When we asked the students made by someone, that person can pass on its stance on us. Just imagine, we can get the moment (skill) which should dozens of levels above our level. And not just one moment that could be passed on! A teacher can pass on up to 3 moves to his student! The advantage is not only for students only. Why? Because the teacher will also get DEV along with the increase in the level of his students and the special items when his completing certain quests. Interesting is not it?!?! It is one of the unique features contained in Yulgang that emotion and not emoticons. We can express various emotions is not the common way using emoticons, but with a real expression applied our character. The look on the face of the character we can cry, smile, angry and more. Types of emotion very much and can be obtained by purchase from NPCs. When you get tired of listening to the song BGM of Yulgang, you can play your favorite songs with the MP3 player is in the game. 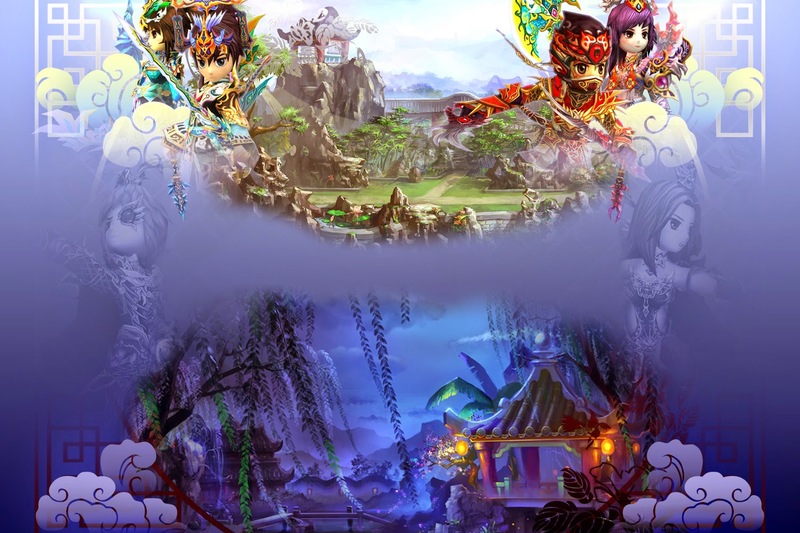 Current players in the world Yulgang adventure will have the honor and karma. Someone will get Honor by completing certain quests, winning the war or killing enemy players from the stream. Players will earn karma when killing players from the same stream. Honor would be useful to do some things in Yulgang while karma will affect the player when interacting with NPCs. NPC could raise the price of some of the items or the most severe NPC will not serve the players at all if the player has bad karma. Karma level 1, the price of the NPC + 30%, and the cost of warehouse + 100%. Karma level 2, the price of the NPC + 50%, and the cost of warehouse + 400%. Karma level 3, the price of the NPC + 100% and + 800% warehouse costs .. Karma level 4, can not use the NPC shops and warehouses. Flow War: The war between the two camps martial world. All the warriors of the white and black stream flow will be fought here. Parties who won the flow will get a chance to fight the special monsters that will provide drop special items. Territory War: The war for control of certain areas controlled by the NPC. Kubu winner will dominate the region and will get a tax from the region. Palace War: The war for control of the palace that the first war to be guarded by NPCs. The winner will get a special tax as well as the skill of the palace. Seat of War / Alliance: War to unite flow followed. Party or alliance that followed the war throne will become supreme ruler flow that followed.